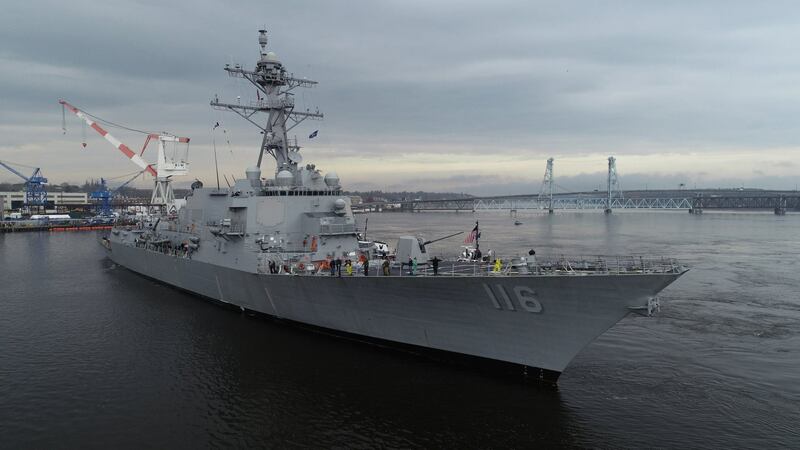 The U.S. Navy accepted delivery of future guided-missile destroyer USS Thomas Hudner (DDG-116) from shipbuilder General Dynamics Bath Iron Works (BIW), June 15. DDG-116 is named in honor of the late Captain Thomas Jerome Hudner Jr. (Ret. ), naval aviator and Medal of Honor recipient. Captain Hudner received the Medal of Honor for his actions during the Battle of Chosin Reservoir in the Korean War when he crashed his plane in an effort to save the life of his wingman, Ensign Jesse L. Brown, the Navy’s first African American aviator. Captain Hudner was laid to rest at Arlington National Cemetery with full military honors on April 4, 2018. During the delivery ceremony, a flag was raised onboard USS Thomas Hudner (DDG-116), which was previously flown over Arlington National Cemetery by Hudner’s former squadron, and also previously flown on USS Constitution December 4, 2017, in honor of the day Hudner attempted rescue of Brown. «The delivery of the future USS Thomas Hudner represents a very special milestone in this shipbuilding program», said Captain Casey Moton, DDG-51 class program manager, Program Executive Office (PEO) Ships. «The ship honors the legacy and heroism of Capt. Hudner and also represents the proud efforts of the shipbuilders at BIW. As the ship now prepares to sailaway and enter the fleet, it will continue the strong Aegis tradition in serving our Navy for decades to come». DDG-116 is the 66th Arleigh Burke-class destroyer and the fourth DDG-51 Flight IIA restart ships to deliver. The ship is equipped with Aegis Baseline 9 combat system, which includes an Integrated Air and Missile Defense capability incorporating Ballistic Missile Defense 5.0 and Naval Integrated Fire Control-Counter Air. Aegis Baseline 9 IAMD destroyers have increased computing power, along with radar upgrades which improve detection and reaction capabilities against modern anti-air warfare and ballistic missile defense threats. These capabilities are designed to provide the U.S. Navy with a 21st century fighting edge. BIW is currently constructing four additional Arleigh Burke-class destroyers USS Daniel Inouye (DDG-118), USS Carl M. Levin (DDG-120), USS John Basilone (DDG-122) and USS Harvey C. Barnum, Jr. (DDG-124), as well as future Zumwalt class destroyers USS Michael Monsoor (DDG-1001) and USS Lyndon B. Johnson (DDG-1002). As one of the Defense Department’s largest acquisition organizations, PEO Ships is responsible for executing the development and procurement of all destroyers, amphibious ships, special mission and support ships, boats and craft.